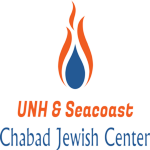 UNH & Seacoast Chabad Jewish Center is dedicated to providing everyone, regardless of background, philosophy or level of commitment, an open door environment for strengthening and enhancing Jewish family life. Chabad serves individuals and families looking for a non-judgmental, accepting, personalized Jewish experience. Chabad offers a warm environment, where everyone is welcome, creating a home away from home for everyone who walks through its doors. UNH & Seacoast Chabad Jewish Center offers an array of services; from a trendy Judaica Shop, to Kabbalah Classes, One on One Hebrew classes, Mommy & Me,, Shabbat Dinners & Services, Holiday Programs, Minyanaire’s Club, Adult Education, The Friendship Circle (Our organization which caters to the special needs community) and lots more.